Click the magnifying glass below to enlarge the image. 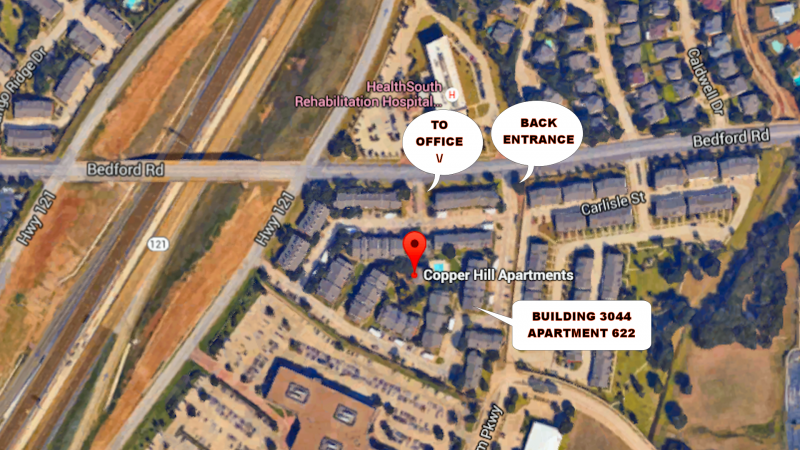 There are two entrances to Copper Hill Apartments from Bedford Road, and there is one entrance directly from the northbound Highway 121 access road. 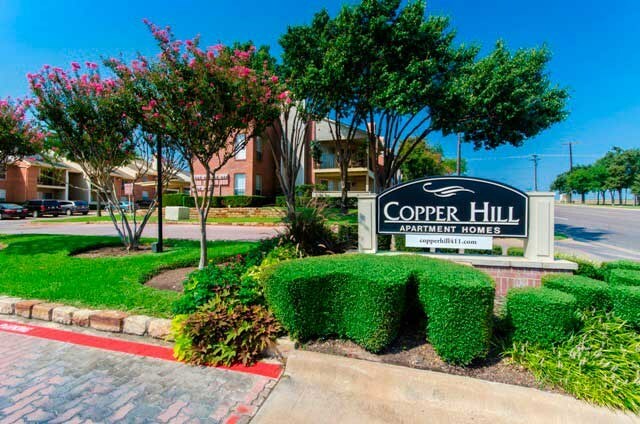 If you take the first entrance from Bedford Road (coming off Hwy 121), the Copper Hill Apartment office will be directly in front of you as you enter. Turn left in the parking lot and follow the road. Turn right when you read the end. My building is on the right. 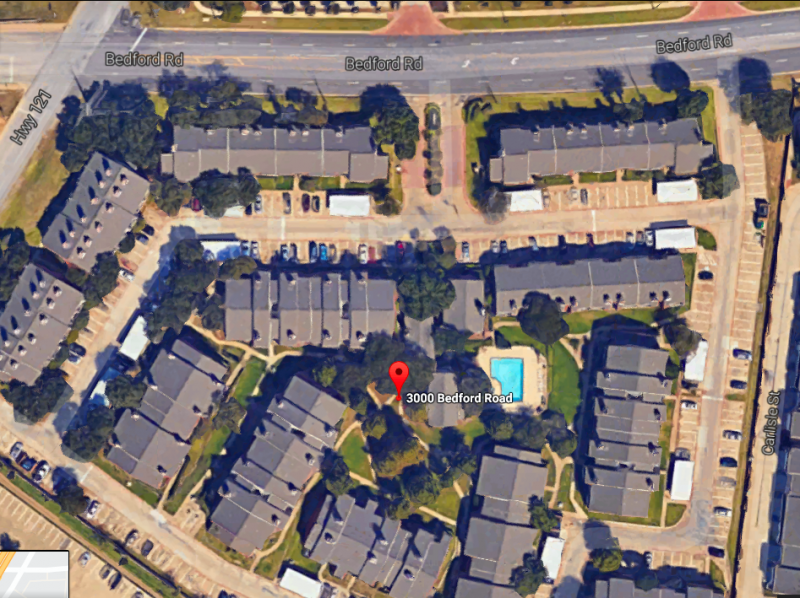 If you take the second entrance from Bedford Road (coming off Hwy 121), which is directly across the street from the entrance to Health South Rehabilitation Hospital, my building is the last one on the right (without having to make a turn). "X" marks the spot for my apartment on this photo. 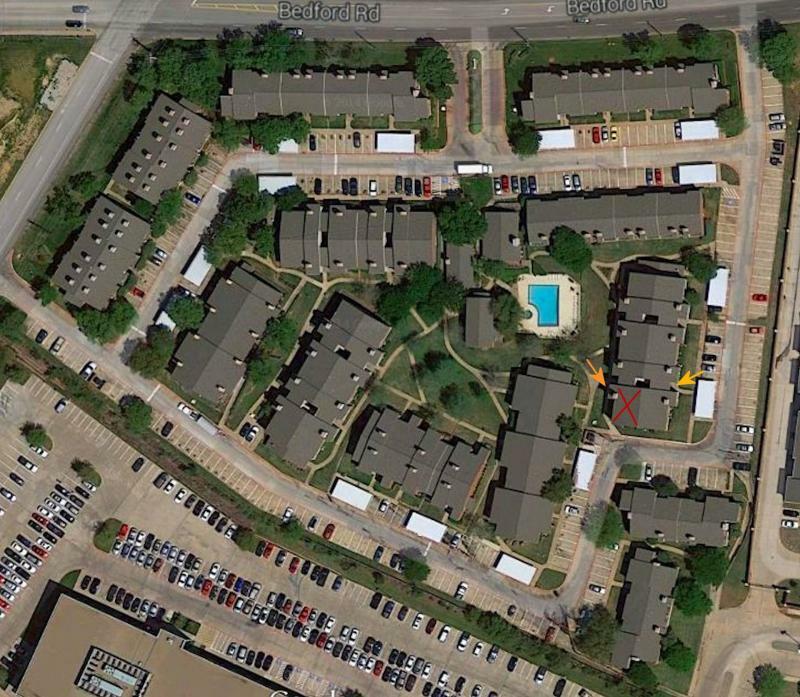 My apartment is at the end of Building 3044 on the back side. There is a sidewalk next to the dumpster that goes up the back way to the swimming pool. The breezeway where my front door is I have marked with yellow arrows on the photo above. The breezeway is open to the front of the building as well as the back. If you walk up on the front side, there are several steps to the porch. If you walk up on the back side (the pool side), there is only one step, and the sidewalk itself is a ramp to the parking lot. So, the apartment is wheelchair accessible except for the step onto the porch of the breezeway and the step into my front door. Don't let the patios convince you there are two apartments. I have a large front patio and a small back patio. My apartment stretches from the breezeway to the end of the building. It's not huge; but it's a good size for me.